19 April 2017 – As part of the global P&G Children’s Safe Drinking Water Programme, Procter & Gamble, in partnership with Massmart, set a goal to raise 500 000 days of clean water to address challenges with access to clean drinking water in South Africa. “Thanks to the generosity of South African consumers, and the support of our partners at Massmart, this goal was exceeded more than two fold, with 1.2 million days of clean water raised,” says Khululiwe Mabaso, CSI Associate Director for Sub-Saharan Africa at P&G. For every P&G product sold through Massmart stores and wholesalers, which include Game, Makro, Masscash, Rhino Cash & Carry, and Cambridge, between 15 February and 14 March this year, P&G committed to donate one day’s worth of clean drinking water to a family who needs it. The final amount donated is equivalent to over 2.4 million litres of clean water, ensuring better health, productivity and helping to prevent malnutrition. “Massmart is committed to championing social equality initiatives in our business and supply chain and leveraging our retail capabilities to make a positive impact. Access to safe drinking water is an important issue, and we are proud to partner with the P&G Children’s Safe Drinking Water Programme,” notes Alexander Haw, Group Sustainability Manager at Massmart. 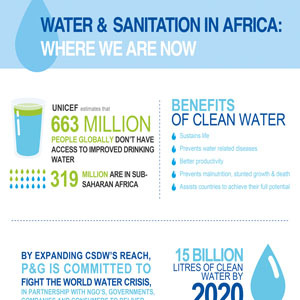 Since 2004, the P&G Children’s Safe Drinking Water Programme (CSDW) has donated nearly 12 billion litres of clean water to needy communities around the world. 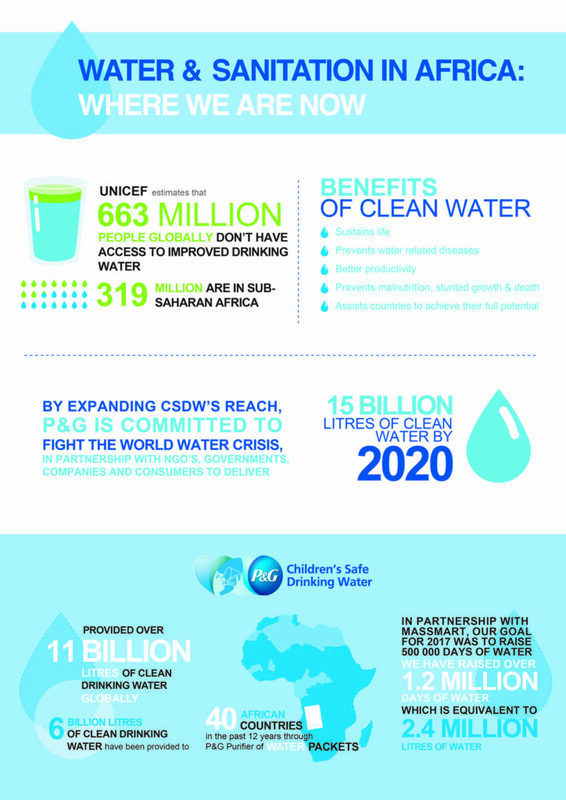 Access to clean water is a global crisis. UNICEF (2014) estimates that 663 million people lack access to improved drinking water; 319 million of these individuals are in Sub-Saharan Africa. The P&G Children’s Safe Drinking Water Programme has provided six billion litres of clean drinking water to 39 African countries in the past 12 years through the P&G Purifier of Water packets. Invented by P&G scientists, each four-gram powdered Purifier of Water packet treats 10 litres of heavily contaminated water by effectively killing bacteria and viruses and removing parasites and solid materials. With only a bucket, a spoon, a cloth and a small P&G Purifier of Water Packet, people can purify 10 litres of dirty water in 30 minutes – enough clean water for a family of five for a day.